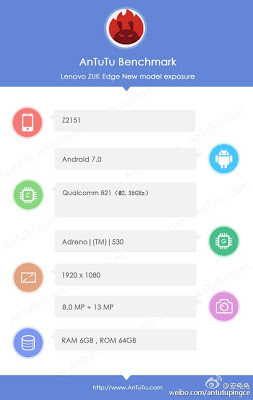 The Lenovo ZUK Edge- which has already cleared TENAA, and has also been the subject of a couple of leaks so far - has now been spotted on AnTuTu. The benchmark listing reveals that the device has 6GB RAM, and runs Android 7.0 Nougat. Other key specs revealed by AnTuTu are inline with what we already know: Snapdragon 821 SoC, full HD display, 64GB storage, and 13MP/8MP camera combo. Moving on, a new leak - showing the About Phone screen of the device - has also surfaced online. While the leak confirms SD821 chipset, 6GB RAM, and Android 7.0, it reveals that the ZUK Edge will also be available in a 128GB storage option.